School resumes on Monday, March 26. Remember, there is no school on Friday, March 30. Nearly 1,000 students at the high school and middle schools participated in a national walk out on Wednesday. 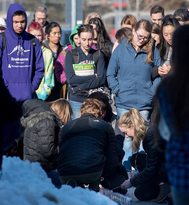 The events were organized by students and lasted approximately 17 minutes – in honor of the 17 victims of the Parkland, FL shooting last month. Pictured at right: High school students lit 17 candles and read each of the victims names before having a moment of silence. A group of school board members, district teachers and administrators, and local parents visited the state capitol this week to share concerns about school safety, mental health, and inadequate funding for schools. 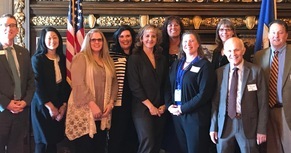 The group met with Senators Karin Housley, Susan Kent and Karla Bigham and Representatives Bob Dettmer, Kelly Fenton and Kathy Lohmer. Parents and community members across the district have reached out to district leaders in recent days with concerns and questions about safety and security in our schools. The superintendent and members of her administrative team have met several times with small groups of local law enforcement officials, parents and community members to discuss what can be done to not only make our buildings more secure, but even more importantly, to address the growing issue of mental health problems among our young people. Conversations and planning are ongoing. Watch for more details to be shared in the coming weeks. See what safety plans are already in place in our schools and learn more about our mental health initiative and social/emotional learning framework. Want to help? Share your concerns about school safety with local legislators! Request our legislators provide additional support and new funding to allow districts to enhance mental health programming and supports, hire additional support staff like counselors and school psychologists, and improve building security. Specifically, advocate for the Special Education cross-subsidy to be addressed. This would free up nearly $8 million in Stillwater, which could be used in part to provide additional support staff for our schools. See the school board’s legislative platform for more information and find a list of local legislators. The Stillwater Area High School Concert Orchestra travelled to St. Louis, Missouri last weekend for a series of performances and workshops. Student also had the opportunity to attend a performance of the St. Louis Symphony and go sight-seeing around the city. For photos visit our Facebook page. SAHS senior Noah Schraut has qualified for nationals in the National Speech and Debate Association Tournament. Schraut was also named the 2018 Student of the Year by the Minnesota Central Speech District. He will now compete for the National Student of the Year title. Read more. Seventh graders at Stillwater Middle School visited Base Camp near Fort Snelling where they participated in rock climbing, archery and other activities. Students explored trust, problem-solving, and overcoming challenges all the while cheering each other on. More than a thousand people attended the College Fair at the high schooll. Students and parents came from 14 area high schools to visit with representatives from more than 120 colleges, universities and trade schools. The College Fair was sponsored by the Minnesota Association for College Admissions Counseling and was hosted by the the SAHS counseling department and College and Career Center. 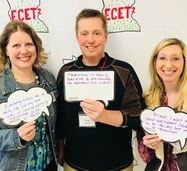 Three educators from our district attended the ECET2 (Elevating and Celebrating Effective Teaching and Teachers) 2-day conference last weekend. Derek Olson (2008 MN Teacher of the Year), Rachel Steil (2015 MN Teacher of the Year finalist), and instructional coach Andrea Schueler joined nearly 100 educators from around the state. The focus of the conference was on trauma-informed education. The sessions gave opportunities for educators to share inspiration, insight, and strategies to support students’ social and emotional well-being. Are you watching your kids scroll through life, with their rapid-fire thumbs and a six-second attention span? Physician and filmmaker Delaney Ruston saw that with her own kids and created an award-winning documentary on mental health. SCREENAGERS reveals how tech time impacts kids’ development and offers solutions on how adults can empower kids to best navigate the digital world and find balance. Please join us to view this documentary and participate in a follow-up panel discussion, Tuesday, April 10, 6 pm in the Oak-Land Middle School Auditorium. Children are welcome and encouraged to come. Space is limited; register online. March 26, 2018, from 11 – 1 p.m. Read official notice online.